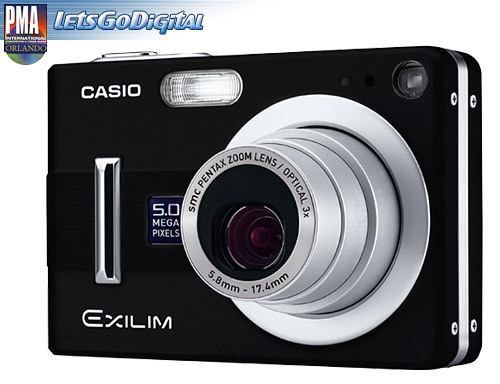 Casio Exilim EX-Z55 special edition: Casio Exilim is well-known for innovative technology coupled with stylish design. Now the Casio Exilim EX-Z55 Zoom is surprising with two Special Editions in trendy colour variations. The "Black Panther" in deep black and the "Deep Blue" in classic royal blue with 5 Megapixels and 3x optical zoom stand for high-resolution photos and are real eye-catchers. All pictures can be admired immediately on the extra-large 2.5-inch TFT colour display. The slim, flat measurements of the "Black Panther" and the "Deep Blue" are also impressive: due to the integration of the optical viewfinder into the display with the aid of FIL technology, the little gems fit into any pocket, no matter how small. Excursions with friends through the scene locations sometimes last longer than planned - it's a good thing that the Super Life battery is so reliable. After charging the powerful lithium-ion storage battery, the Casio Exilim "Black Panther" and Exilim "Deep Blue" each take up to approx. 400 pictures. The Casio EX-Z55 digital cameras are impressively fast: they are ready to use in approx. 1.6 seconds and captivate with a shutter-release time lag of only approx. 0.01 seconds. This makes snapshots effortless. The change between close-ups and photos of motifs in the distance succeeds with the Auto Macro function. It switches independently from the Autofocus into the Macro Mode and back again as required. If the bar is only dimly lit, the Flash Assist function automatically mostly brightens up pictures that have turned out too dark. With the BESTSHOT function, the only thing both beginners as well as experts will find difficult is choosing between the 23 pre-set motif programs. Varied photo scenarios in different situations provide uncomplicated photography here. Wonderful experiences with your friends definitely have to be recorded on film so they remain vivid memories. In the Movie function, the "Black Panther" and "Deep Blue" record films with sound with no time limit. With all the functional diversity, the Icon Help function always shows the scene photographer in which mode he is currently operating. In order to transfer picture data to the hard disk of the computer, the USB docking station produces the connection to the PC. The Casio EX-Z55 also comes complete with a Super Life battery, USB cable, detailed software on CD-ROM as well as a carrying strap. The matching underwater casing EWC-55, the mobile charger BC-30L and diverse camera bags are optionally available. Availability of the Casio Exilim EX-Z55: The Casio Exilim Zoom EX-Z55 special edition digital cameras are available from February 2005.